This recipe was created in partnership with the Ohio Pork Council; all opinions and text are my own. Thanks for supporting us and the brands we love! 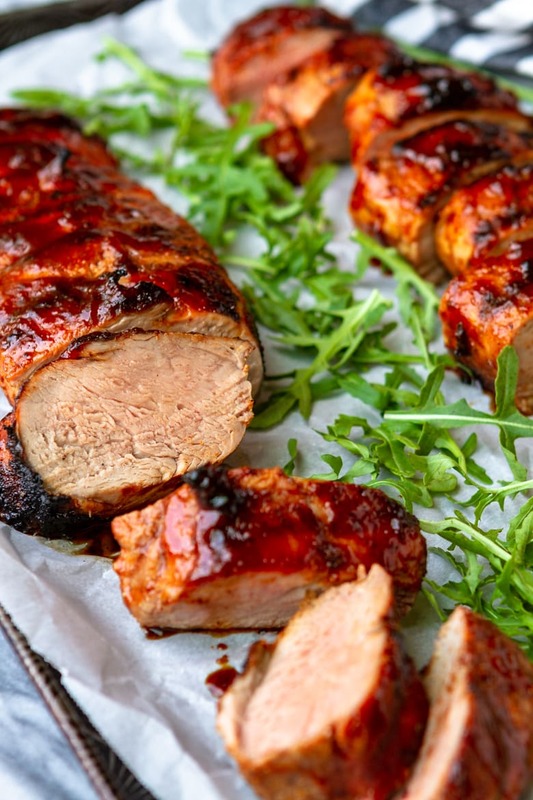 Let’s just put it out there… How amazing does this grilled pork tenderloin look?! And it tastes even better, if I do say so myself. Grilling pork tenderloin is shockingly easy. So simple, in fact, you can even make it on a weeknight! No joke… Even if you’ve never grilled anything larger than a cheeseburger, DON’T WORRY. I know the first time I tried it, I was certain I would end up with an inedible, charred brick that was somehow still raw in the center. But pork tenderloin is virtually impossible to overcook when you use a digital meat thermometer. 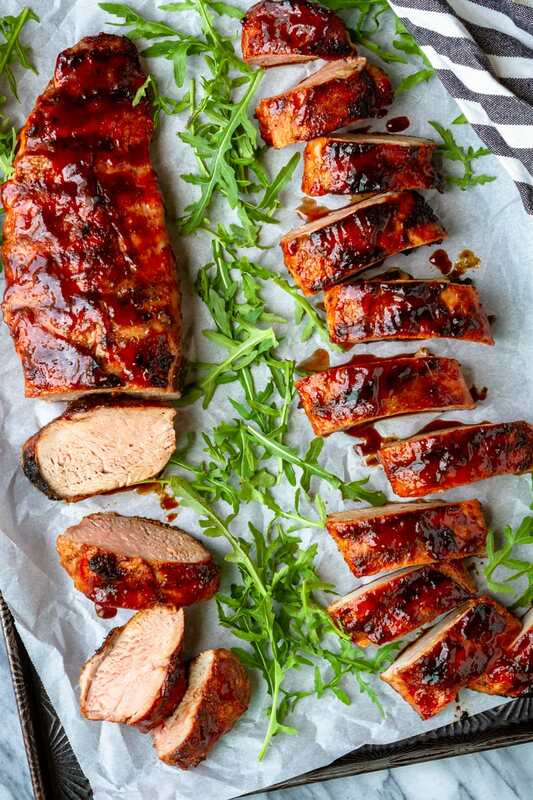 Before we talk about the “how”, let’s spend just a moment on the “why” — namely WHY you should try this grilled pork tenderloin recipe. We’ve already established that it’s easy to prepare and is mind-blowingly delicious, but what you may not know is that pork tenderloin is an extremely budget-friendly protein. I routinely find it priced at under $2.49 per pound, which makes feeding my hungry boys a little easier on the ole wallet. Because man, can they EAT! This affordable pricing also makes it ideal for feeding a crowd. Typically pork tenderloins come packaged in twos, with each tenderloin weighing between 1 to 1.5 pounds. This should be plenty as a main dish for a family of 4-5. For reference, I usually prepare 4 tenderloins for my family of seven, which includes two pork-loving teenage boys. If you’re making this grilled pork tenderloin recipe for a large gathering, plan on about 1/2 pound per person. And if you end up with leftovers? Rejoice, because pork tenderloin reheats like a dream! 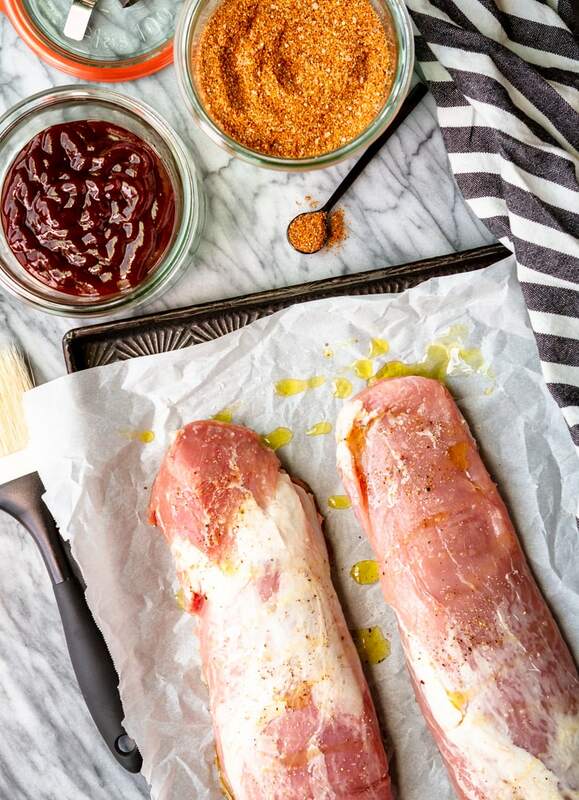 Are you ready to try your hand at grilling pork tenderloin? Get your ingredients in order first. 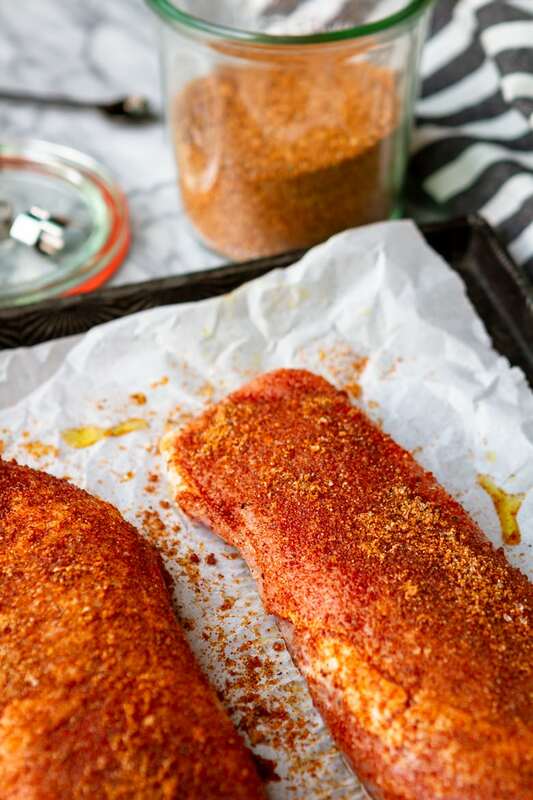 You’ll need some olive oil, a good dry rub (try this amazing sweet, smoky & spicy BBQ pork rub recipe), and your favorite BBQ sauce — plus, of course, your pork tenderloins. Seriously, that’s it! Give your pork tenderloins a drizzle of olive oil, rubbing it on all sides. Sprinkle each with about two tablespoons of the pork rub, and work it in all over. I’ve heard others say that, at this point, you should let your tenderloins sit for about 30 minutes before grilling, but honestly, I’ve tried it both ways and haven’t found it to make a difference. So why wait? Just go ahead and plop them on your grill over medium-high heat for about 7 minutes per side. Now is the time to whip out your digital meat thermometer to check the internal temperature of the tenderloins. This is the key to a perfectly grilled pork tenderloin — internal temperature trumps cook time. Our goal is to cook them to as close to 145 degrees as possible, which keeps the tenderloin super tender and juicy, with just a blush of pink inside. Whoa, don’t panic — it’s absolutely OKAY for your pork to be a little pink after cooking! The guidelines for cooking pork were revised several years ago, and my friends at OhioPork.org have assured me that 145 degrees is more than sufficient for safe consumption. Now more dry, overcooked pork sounds good to me! When the internal temperature reaches about 140 degrees, brush the top and sides of each tenderloin with your favorite BBQ sauce, and then monitor the temperature closely until it reaches 145 degrees. Your total cook time will be right around 18-20 minutes. Finally, and this is ultra important, let your tenderloins rest for about 3 minutes after removing them from the grill before slicing and serving. This will be tough, because they will smell simply incredible, but I have faith that you can resist. Slice and serve warm with your favorite side! PIN IT NOW! 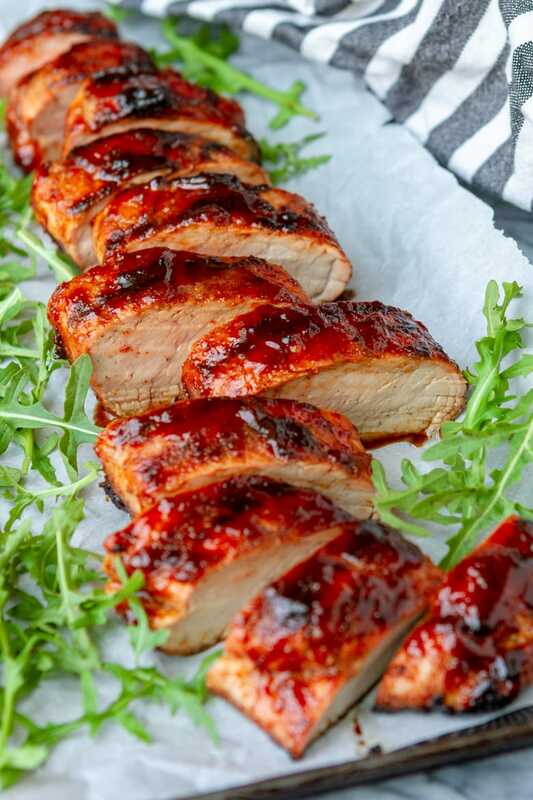 CLICK HERE TO ADD THIS BBQ GRILLED PORK TENDERLOIN RECIPE TO YOUR GRILLING RECIPES BOARD ON PINTEREST! Pat pork tenderloins dry. Rub each with about 1 tablespoon of olive oil, plus 2 tablespoons of pork rub. Grill over medium-high heat for 7 minutes per side. Check the internal temperature of each pork tenderloin with a digital meat thermometer. When it reaches 140 degrees, brush the tops and sides of each tenderloin with your favorite BBQ sauce. Continue to cook until the internal reaches 145 degrees. Remove the tenderloins to a platter and allow them to rest for 3 minutes before slicing. I’d love to see how your grilled pork tenderloins turn out… Tag me @Unsophisticook and @OhioPork on Instagram or use the hashtags #ohpork and #Unsophisticook so I can check it out. Enjoy! Looks delicious, and love that it’s really simple. I’ve grilled tenderloin a couple times and it’s a great cut for grilling. I would have to try that with lamb or beef. Not sure how it will work with poultry. What kind of spices are there in the mix? That glaze has me drooling, it is the perfect caramelized color! I love tenderloin but have never tried grilling it – that changes ASAP! Looks AMAZING! Can’t wait to try this! THIS LOOKS SO GOOD! I actually just grilled pork for the first time the other night and my husband has decided that we will never eat pork any other way again. HA! Can’t wait to try this recipe! Isn’t it the best? And I can’t get over how quick it is! 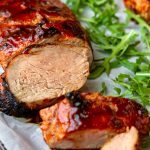 We tried grill pork tenderloin last summer for the first time and were also impressed by how easy it was! Will be trying this recipe soon – we LOVE spicy! !